Zavok is a Zeti and the leader of the Deadly Six, the main antagonists of Sonic Lost World. When Dr. Eggman came to the Lost Hex, Zavok and the other members of the Deadly Six were forced into serving him, due to the effects of his Cacophonic Conch—however, after Sonic rashly got rid of the conch, the Deadly Six rebelled and took control of Eggman's forces. Zavok, along with Zazz and the rest of the Deadly Six, appears as part of a trophy in Super Smash Bros. for Wii U, which can be seen below. Although he doesn't appear directly in Super Smash Bros. Ultimate, Zavok is alluded to in Sonic's route (based off various Sonic the Hedgehog games) through the similar-looking Incineroar, which stands in for him in a fight in Windy Hill Zone. 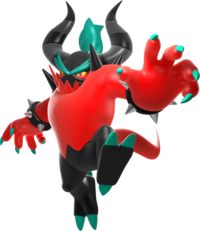 Zavok makes an appearance as an unlockable playable character in the Nintendo 3DS and Wii U versions of Mario & Sonic at the Rio 2016 Olympic Games, where he is exclusively playable in the Boxing event (he is also playable in Boxing Plus in the 3DS version). This marks his first playable appearance. In the 3DS version, Zavok appears during the sixth day of Sonic's Story in Road to Rio mode. If the player talks to him, he challenges them to a match of Boxing Plus. If the player accepts and wins, Zavok is unlocked as a playable character in Boxing and Boxing Plus in other modes. In the Wii U version, Zavok has a high power stat, fairly low speed, and middling technique. In this version, there is a chance of Zavok appearing on Copacabana Beach during the Boxing tournament. If he is talked to, his flag is earned. Additionally, he can appear after said tournament is won and challenge the player to a Boxing match - if the player defeats him, he is unlocked as playable in Boxing. Wii U Sonic Lost World (10/2013) NA: The tough and intelligent red leader Zavok! A feisty color to match her feisty personality, Zeena! A fan of the noms, Zomom! Sharp horns and a sharper tongue, Zazz! Braindishing both age and wisdom, Master Zik! And finally, the brooding spy, Zor! Give it up for the Deadly Six! PAL: Zavok, the leader, has a sharp mind and tough fighting skills. Zeena is a cruel siren with a fierce temper. Zomom has a habit of eating everything in sight, and Zazz is crazy about brawling. The elderly Master Zik taught Zavok how to fight, and brooding Zor is the group's spy. Together they are the Zeadly Zix! Sorry, no - the Deadly Six. Zavok is the strongest of the sinister Zeti and the leader of the Deadly Six. As the last disciple of Master Zik, he's a certified force to be reckoned with. Along with his formidable physical prowess, a calm demeanor and penchant for quick-thinking makes his well-suited to leadership. His greatest joy is in improving his skills, which makes the straight-forward competitive nature of the Olympic Games quite appealing. This page was last edited on March 24, 2019, at 04:18.